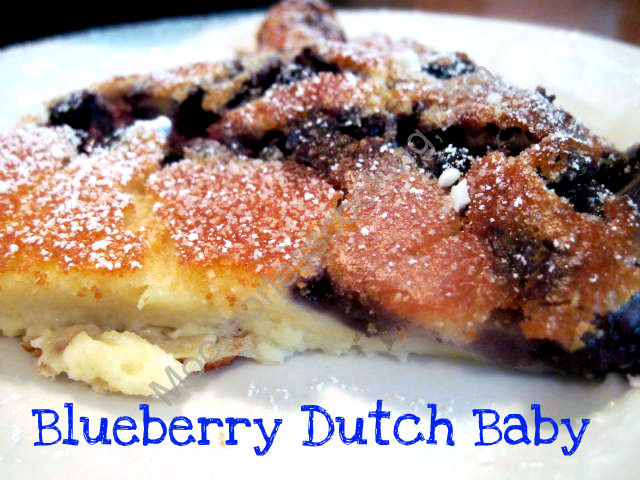 If you haven’t had a Dutch Baby, you are missing out! It’s like a combination of a crepe and a popover. Since blueberries are in in full swing now, I had to try it with my favorite berries. Wow, we just loved it. Just a dusting of powder sugar is perfect for me, hubs loves it with his Maine Maple Syrup. You see what you like! WHAT IF YOU DO NOT HAVE A CAST IRON PAN? I made my dutch baby in a cast iron skillet but it can be made in any oven-safe dish such as a pie dish, square or rectangular glass baking dish or even a roasting pan. So you don’t need a cast iron pan in order to make this for breakfast. I used a 10 1/2 inch Cast Iron Skillet. Does the melted butter go into the blender and then poured over berries, or melt it in the pan and keep it on skillet bottom?